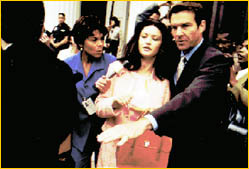 Catherine Zeta Jones and Dennis Quaid in Traffic. Steven Soderbergh examines the current war on drugs in his latest film Traffic, starring Michael Douglas, Don Cheadle, Benicio Del Toro, Luis Guzman, Dennis Quaid and Catherine Zeta-Jones. The very structure of the film -- a series of intricately interwoven stories about several characters -- conveys the complexity and enormity of this battle. Had this film been told in a strictly linear fashion, as a standard good-guy-protagonist-fights-the-bad-guys contemporary thriller, the world of drug trafficking probably would not have been as realistically and fully portrayed. From the onset, it isn't clear who the good guys are here. The film jumps back and forth to characters on both sides -- as well as to those not engaged directly in the battle, but nonetheless affected by the struggle. This manner of storytelling, some terrific acting performances [Benicio Del Toro owns the screen] and an almost-documentary style of filming add authenticity to the film. Traffic feels like the real deal. Writer Stephen Gaghan traveled across the country to research the story, meeting with policy makers in Washington, D.C. -- the Deputy Secretary of Defense, the DEA, the Office of Drug Control Policy, the head of the Association of Police Chiefs and members of think tanks. He interviewed journalists at The Washington Post and The New York Times, where he met Tim Golden, an investigative reporter and Pulitzer Prize co-winner for International Reporting for his in-depth coverage of drug corruption in Mexico, who would go on to serve as consultant to Traffic. Says Gaghan, "I met many smart, committed people with passionate opinions. People who have essentially dedicated their lives to keeping children off drugs. These were people with multiple graduate degrees who were working in public service for their country, for the American people. I had notebook after notebook of incredible quotes, and what I came away with first and foremost was a sense of despair. Speaking candidly, nobody believed the current policies were working -- nobody. It fascinated me that there was no easy answer to the problem." Soderbergh has said, "If we've done our jobs right on Traffic, everybody will be pissed off." They have done their jobs right.